Kilim weaving [килимарство, kylymarstvo]. The term ‘kilim’ (Ukrainian: килим, kylym) is of Turkic origin and denotes an ornamented woven fabric used to cover floors or to adorn walls. The earliest references to kilims date back to the chronicles of Kyivan Rus’ and link them to burial rites. The princes used kilims also as chair covers. References to kilims are found in bylyny and historical songs. Kilims are depicted in the frescoes of Saint Cyril's Church (see Saint Cyril's Monastery) in Kyiv and in portraits of the late 17th and early 18th centuries. Nothing definite can be said about kilim weaving in Ukraine before the 16th century. The earlier kilims belonging to the ruling class most likely had been imported. The earliest references to kilim imports from eastern countries occur in 15th-century sources. Kilim production in Volhynia in the 16th century is well documented; eg, a 1578 document listing Maria Holshtanska's dowry mentions two serf weavers, Yurko and Fedir. There are many 17th-century references to both locally produced and imported kilims. By the 18th century, kilim weaving was widespread: in Right-Bank Ukraine the mills owned by the Czartoryski and Potocki families, and in Left-Bank Ukraine Col Pavlo Polubotok's mill, were well known. Although kilim weaving may have been taken up by peasants much earlier, in the 18th century it became widespread among them. Monks and town craftsmen also engaged in weaving. The industry grew rapidly at the end of the 18th century and in the first half of the 19th century. New mills were opened by landowners on their estates, especially in Left-Bank Ukraine, and in the towns. By the mid-19th century, Kharkiv's yearly production of kilims and woolen caparisons amounted to 25,000 pieces. During the second half of the 19th century the kilim industry in Ukraine suffered an abrupt decline. Kharkiv's annual output, for example, fell to 4,000 kilims. Some measures were taken by individual manufacturers and zemstvos to counteract this trend. The Poltava zemstvo opened a kilim-weaving school, promoted kilim sales, and set up a collection of traditional kilims. In 1905 Varvara and Bohdan Khanenko organized a weaving cottage industry in Olenivka village, Vasylkiv county, Kyiv gubernia. Her craftsmen served a two-year apprenticeship. Volodyslav Fedorovych started a kilim-weaving school and workshop in the late 1880s in Vikno village, Ternopil region. At the beginning of the 20th century the main kilim-weaving districts in Left-Bank Ukraine were the counties of Myrhorod, Romny, Poltava, Pryluky, and Zinkiv, Poltava gubernia. Thanks to the efforts of the artist Yevheniia Prybylska, a weaving cottage industry sprang up in 1913 in Skoptsi village, Kyiv gubernia. Kilim weaving prospered also in the Katerynoslav region, Podilia, and the Ternopil region (Zbarazh, Zalozhtsi, Tovste, and Vikno). In the late 19th and the beginning of the 20th century, new kilim-weaving centers sprang up in Galicia under the influence of the developing kilim industry in western Podilia. The Weaving Society, founded in 1886, began to produce kilims in 1890. In 1894 the society opened a weaving school, which in the 1920s was transformed into a kilim factory. A number of short-lived kilim mills were set up in the vicinity of Kosiv, Ternopil, Chortkiv, Zbarazh, Zhydachiv, and Lviv. A kilim industry existed in Transcarpathia in the 19th century, although information about it is sparse. In 1905 a co-operative kilim mill was organized in Hanychi village, Tiachiv county. Another mill appeared in Ardanove village, Irshava county. 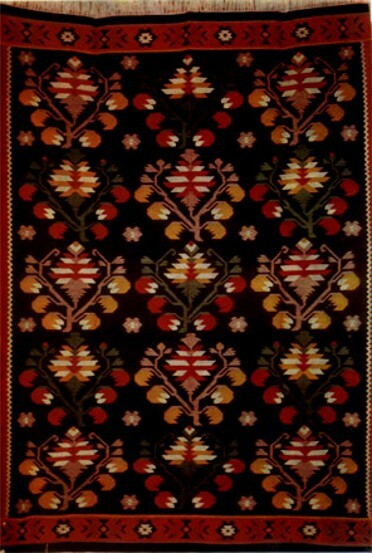 Bukovyna had a well-developed kilim industry in the 19th century. In the 1920s a kilim weaving school was opened in Ataky, Bessarabia. At the beginning of the Soviet period the kilim industry in Ukraine experienced some serious difficulties: there was a shortage of equipment and raw materials, and private mills had closed down. With much effort the new authorities restored kilim weaving in its traditional centers. Workshops and art schools were set up in the Poltava region, Chernihiv region, and Kyiv region and in eastern Podilia to train qualified workers for the kilim industry. The industry was organized into handicraft (or the so-called artcraft) artels and was encouraged to produce kilims for export. Between 1928 and 1930 its output increased from 40,000 to 100,000 rubles' worth. In the 1930s the artels were turned into large state enterprises and were brought under the Ukrainian Handicraft Association (est 1936). Their production was regulated by the five-year plans. Today the more important kilim enterprises are located in Reshetylivka, Dihtiari, Hlyniany, Kolomyia, Khotyn, and Kosiv. Since the Second World War kilim production at these centers has grown steadily, with geometric kilims outweighing floral ones. Hlyniany's output increased from 15,000 sq m in 1945 to 49,000 sq m in 1960 and 82,000 sq m in 1970; Kosiv's from 95,000 sq m in 1955 to 120,000 sq m in 1965; and Khotyn's from 10,600 sq m in 1950 to 17,000 sq m in 1960 and 46,000 sq m in 1970. Kilim making is a complex and labor-intensive process that includes yarn spinning, dyeing, and weaving. Traditionally, the necessary skills were passed on from generation to generation. Originally, the basic material was sheep's wool. Later on cotton and flax yarns were introduced, and in recent times synthetic fibres that are resistant to rot, mold, and moths have been adopted. Until the second half of the 19th century only natural dyes, mostly from local plants, were used. Yellow and green dyes were obtained from onion husks and blackthorn berries, red dyes from cochineal insects, black and gray dyes from oak gall, brown dyes from young alder bark, and blue dyes from indigo shrubs. These natural dyes produced pleasant soft colors that were very fast. Today, synthetic dyes have replaced the traditional natural dyes. Two basic types of looms—vertical and horizontal—have been used in kilim weaving. Flat-woven as well as knotted kilims were prepared on vertical looms. Patterns were produced by the interlocked tapestry weave: the wefts were woven back and forth into the warp by hand until the desired color area was defined. Then the background was woven in mechanically. Horizontal looms, which are mainly for geometric patterns, were introduced later. Today kilims are produced in the traditional way and on the somewhat more modern Axminster and Jacquard machines. The oldest record about the ornamentation of Ukrainian kilims dates back to the 16th century. 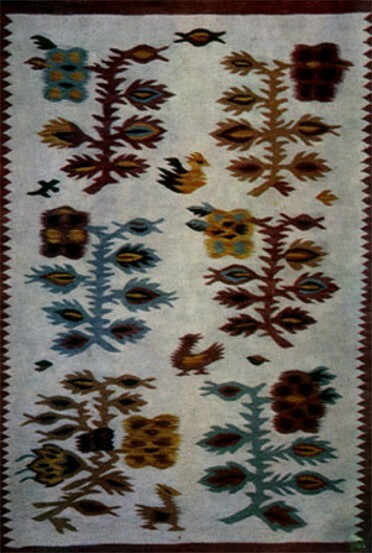 It describes kilims ‘with various flowers,’ two of them with a light blue, two with a white, one with a yellow, and five with a black background. Three 17th-century kilims have been preserved. 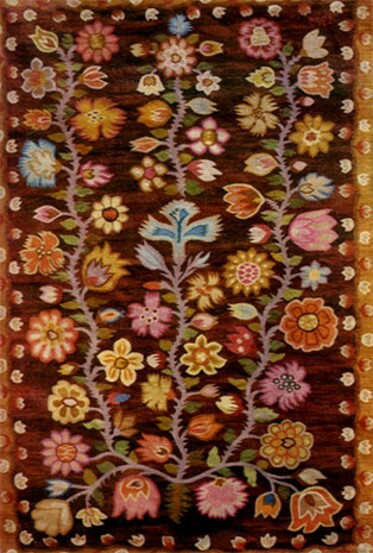 One of them, a piled kilim with a floral ornament, was produced in 1698 at Stanisław Koniecpolski's mill, which was built in Brody in the mid-17th century. 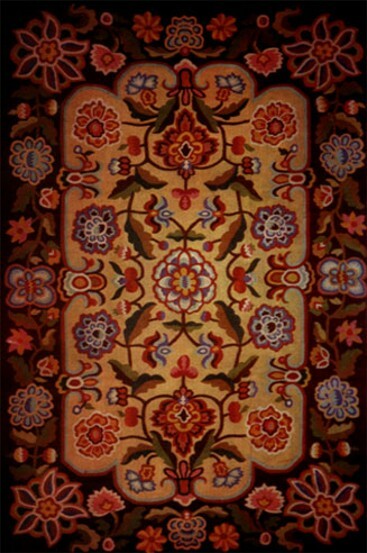 The ornamentation of 18th-century kilims consisted mostly of plant designs, which display much originality and local variations. The plants depicted on Right-Bank Ukraine's kilims tend to be slenderer and more stylized than those on Left-Bank Ukraine's kilims. Geometrical ornaments were more widespread than floral ones. As the market for the geometrically ornamented kilims grew, the floral ornamentation evolved towards a more geometric, stylized pattern. The geometrically ornamented kilim was and continues to be the basic type of kilim produced in Galicia, Bukovyna, Polisia, Podilia, and the Hutsul region of the Carpathian Mountains. Many motifs on these kilims symbolize natural phenomena as they appeared to a primitive mind. For centuries the magical symbols revered by the common people were depicted in folk art. In time they lost their original meaning and became simply decorative elements. In addition to geometrical and floral designs, Ukrainian kilims in the past also depicted coats of arms, emblems, scenes from gentry life, and religious images. During the Soviet period such themes were often replaced by portraits of Soviet leaders and scenes from Soviet life.